Quality die cast aluminum provides a blemish-free finish without the porosity often found in other castings. 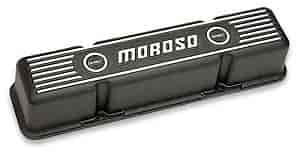 American-made valve covers using the finest materials and workmanship available. Unlike other brands, precision-cast sealing lip holds gasket firmly in place while installing covers and eliminates leaks. Stock height clears factory accessory brackets, original equipment rocker arms and roller rockers. Tall Design clears stud girdles. Sold in pairs.